Regular readers know I’m a big fan of Big Bob Mitchum, having covered nine of his classic films. The self-effacing Mitchum always downplayed his talents in interviews, but his easy-going, naturalistic style and uncanny ear for dialect made him one of the screen’s most watchable stars. Whether a stoic film noir anti-hero, a rugged soldier fighting WWII, a romantic lead, or a malevolent villain, Mitchum always delivered the goods. Last night I watched THE NIGHT OF THE HUNTER for the first time, and his performance as the murderous ‘Reverend’ Harry Powell just zoomed to the top of my list of marvelous Mitchum performances. 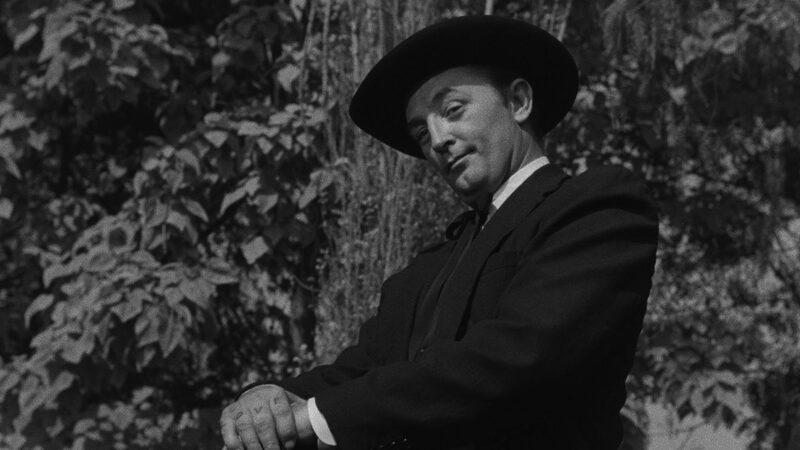 Listen to Mitchum’s pitch-perfect vocal cadence; he could fit right in as a cable network Southern preacher right now! The Rev has come to this idyllic West Virginia town after being incarcerated for car theft. His cellmate was Ben Harper ( Peter Graves ), a Depression Era man who robbed a bank to feed his family and killed two people in the process. Before being hanged, Harper let slip where he stashed the $10,000 from the crime. Only his two children know the secret, and Powell has ventured forth to do God’s work by finding out where the money’s hid. He woos and wins Harper’s widow Willa ( Shelley Winters ), but Harper’s son John immediately recognizes Powell for what he is, a con man come to steal the ill-gotten gains Dad left behind. 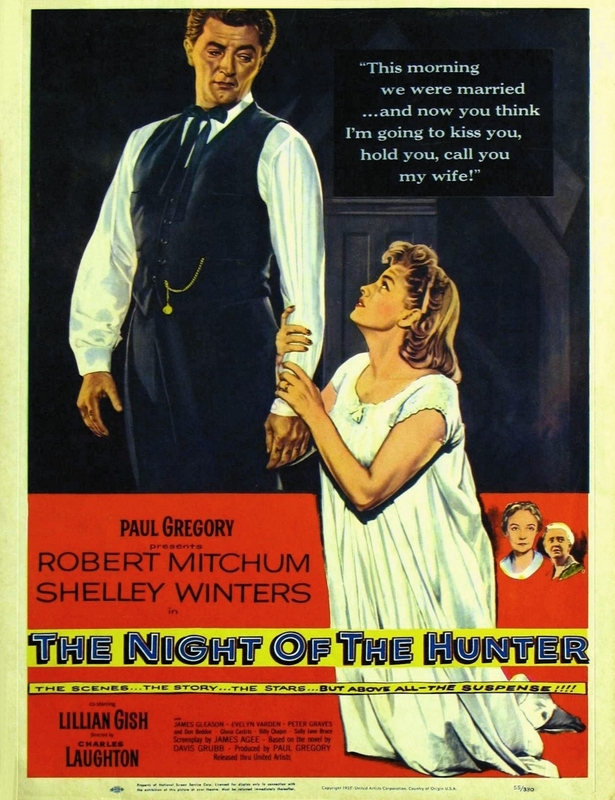 Mitchum creates such a chilling character in NIGHT OF THE HUNTER, you’ll have no reason to cheer for him. On his wedding night, he berates his new bride for her carnal instincts, later murdering her with his switchblade in their bedroom after she learns the truth about him. The bedroom itself is designed to resemble a cathedral, their bed a sacrificial altar. He cajoles and threatens the kids, growling and howling like an animal, eyes blazing from their sockets like the devil himself. It’s a portrait of pure evil straight out of a horror movie, and Robert Mitchum proves all his talk about being a “one-note actor” was just blarney. But that’s Mitchum being Mitchum, a true artist who was so good at what he did he made it look easy. 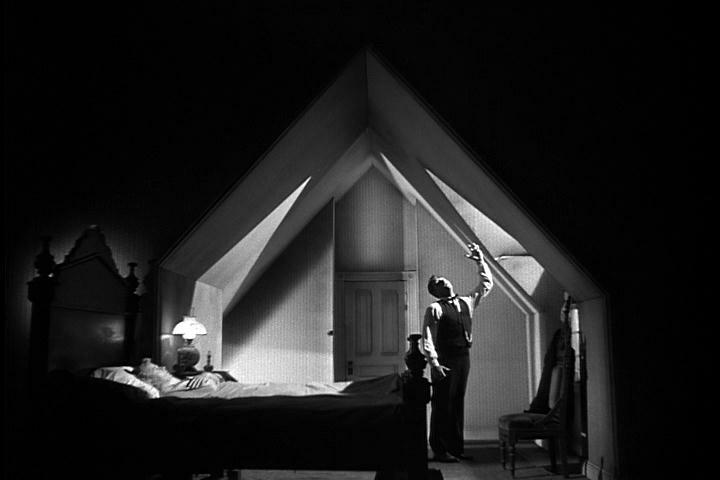 THE NIGHT OF THE HUNTER was the only film directed by another great actor, Charles Laughton , who used the expressionistic style of silent film directors like F.W. Murnau and especially D.W. Griffith, to the point of casting Griffith star Lillian Gish in the pivotal role of Rachael Cooper, a farm widow who takes in stray youngsters, and becomes the salvation for the Harper children. Miss Gish stands toe-to-toe with Mitchum both in her character and in the acting department, the “Love” to Harry Powell’s “Hate”. The entire cast is superb, with James Gleason a standout as alcoholic “Uncle” Birdie, who discovers Willa’s body at the bottom of the Ohio River. Don Beddoe , Gloria Castillo, and Evelyn Varden also shine in their minor parts. 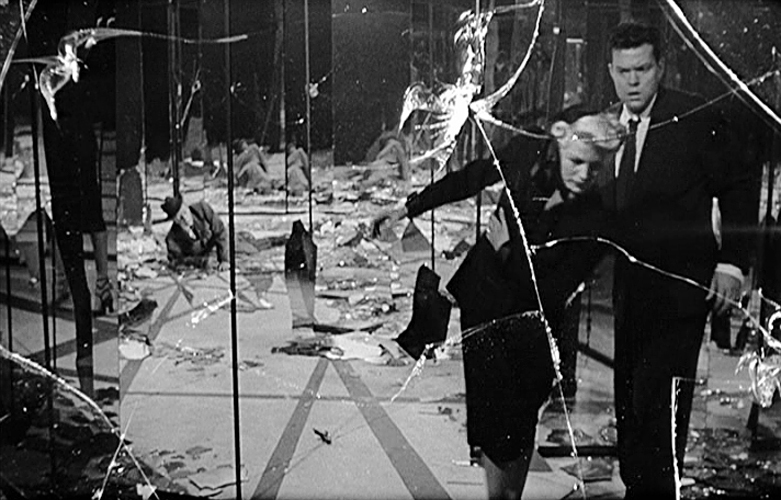 The film wasn’t well received at the time of its release, and a disheartened Laughton never directed another film. 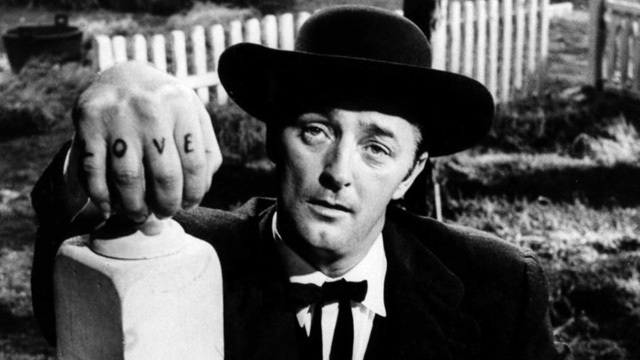 It’s our loss, as his baroque stylings made THE NIGHT OF THE HUNTER a masterpiece of cinematic art. Today it’s regarded as a true classic, and the performance of Robert Mitchum has a lot to do with that. Along with his Max Cady in CAPE FEAR, Mitchum embodies evil unlike any other actor in film. Happy 100th birthday Bob; here’s to 100 more years of audiences enjoying your wonderful work! Mitchum is the coolest actor of all time in my opinion. He gave so many incredible performances. He is utterly terrifying in Cape Fear and Night of the Hunter. My favourite film of his is Heaven Knows Mr. Allison. Isn’t it lovely? I think he and Deborah made a terrific screen team, I wish they made many more films together (they only worked together 4 times)and they became good friends. My favorite Mitchum/Kerr movie is “The Sundowners”, but “Mr Allison” is a close second! The Sundowners is a great film! I’ve never seen either Cape Fear film as I want to read the novel first. 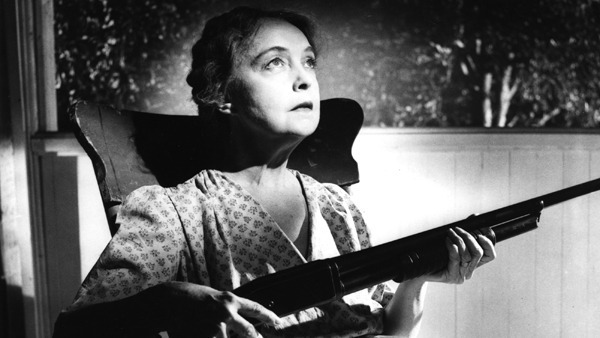 However, Night of the Hunter is a fantastic film. It’s got a little bit of everything, horror, suspense, thriller. I loved it the first time I saw, but haven’t seen it in a while. It’s on my movie shelf somewhere. I believe it’s playing on TCM tonight at 8:00 EST, Drew. I too watched this for the first time early this year. Mitchum was incredible. That bedroom cathedral set proved to be very eerie as was that incredible underwater scene! Oh and shotgun granny was ace too.